DeLand's Historic Athens Theatre, an Italian Renaissance structure designed in 1921, housed vaudeville and silent movies. Now restored, the theater presents films, concerts, stage performances, and educational events. DeLand, Florida, (population 24,375) was founded by Henry A. DeLand in 1876 with the purchase of a $1,000 plot of land. DeLand is located in Volusia County, about halfway between Orlando and Daytona Beach. In 1883, DeLand established the DeLand Academy, but a severe 1885 freeze destroyed his orange crops, and he could no longer support it. John B. Stetson took over the endowment, and the academy became John B. Stetson University, later shortened to Stetson University. The original building, which housed DeLand Academy, is still part of the campus. A fire in 1855 led to a mandate that all downtown buildings must be built using masonry instead of wood. (Because the fire started in a saloon, saloons were banned from the downtown as well!) DeLand is filled with oak trees, the result of an 1886 tax break of 50 cents for each newly planted oak tree that lived for one year. In 1887, the Volusia County Courthouse was moved from Enterprise to DeLand and was rebuilt in the same spot in 1927. In the 1920s, DeLand saw a dramatic increase in both population and construction. Subdivisions opened throughout the area, and the downtown boasted new sidewalks. The city limits were expanded but contracted again in 1928, when hard economic times hit the region. Today, the town encompasses just one square mile. During WWII, the Navy built an airbase in DeLand. It was turned over to the city in 1946 and now serves as the municipal airport. The DeLand Naval Air Station Museum is located there, and offers tours and educational programs that highlight DeLand’s military history. Deland has more than 600 properties listed on the local or National Register of Historic Places. 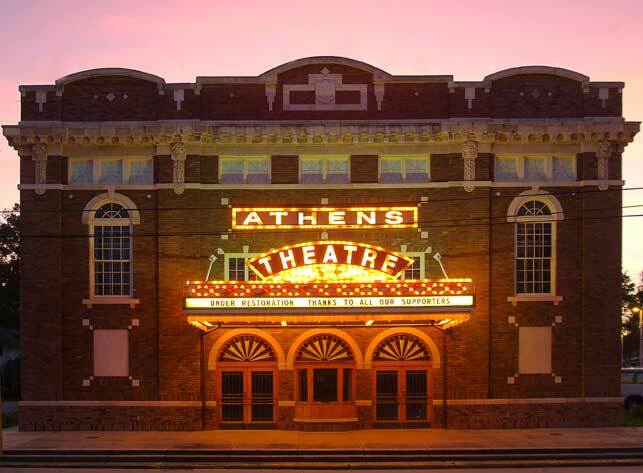 One example is the Historic Athens Theatre, an Italian Renaissance structure designed in 1921 which housed vaudeville and silent movies. Now restored, the theater presents films, concerts, stage performances, and educational events. Other attractions include the Henry A. DeLand House Museum and the DeLand Memorial Hospital Museum. The West Volusia Historical Society hosts a number of regular events, including historic Oakdale Cemetery walks, historic re-enactments, historic building restoration workshops, and a tour of historic homes and buildings.